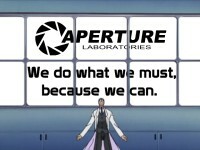 This video is, of course, designed for fans of Portal. I realise that "Still Alive" has been used a lot, but some of the videos I saw were largely lipsync, or didn't explore very much. I got the idea that the portal looks like the "Will of the Universe" from Excel Saga, and this intrigued me. I also had ideas like the multiple transport mishap, the cloning via 2exits1entrance, and new "icons". The spherical Haros from Gundam Seed are used for GLaDOS herself. The structure of the song is a little weird (in terms of making a video) since it starts with a conclusion, and goes on to describe what happened. I had the idea to make the video loopable. Although the first frame is not identical to the last frame, they are similar in structure, and the background is simply a scene change which is a logical progression given what is happening.